With the invention of the digital camera whole new worlds opened up for my husband and me. Jeff bought our first digital camera and was so excited. Frankly, so was I. The thought of being able to almost instantly print out pictures, not having to spend money on printing out the ones that hadn’t turned out right, was almost intoxicating. And that was when the dilemma started. Jeff had always preferred to have a camera that was as advanced as we could afford. I had no problem with this in theory, but in reality, it translated into a bigger, bulkier camera then I felt comfortable with, a dSLR. 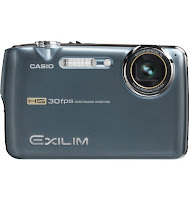 I found myself not using our camera as often as I had previously, then the Casio Exilm ex-fs10 came into my life. This camera included everything I wanted, with the added benefit of also not making my husband want to pull all his hair out. So, I’ll go through the expectations. It’s small. This is important to me. I need to be able to drop it into my purse and go. Often, I will just leave it in my purse so that when I showed up at my daughter’s student of the week assembly after spending several hours grocery shopping and running other errands, I could still snap pictures of her beaming from the stage as they handed her a computer generated certificate and unsharpened pencil. In the past, I have forgotten to bring a camera with me so these moments weren’t being recorded. The Exilm also has a large view screen. I can easily see exactly what my picture looks like. The only problem is that it’s too fast in saving to the memory card. I don’t have enough time to delete before it saves but that’s only a small nuisance. Another of the features that I really enjoy is the ease of use. I can fill my 4 gig card at family events, come home, pop the card into my computer and download the pictures in no time at all. For those of you without a card slot on your PC, it does come with a cord for equally easy downloading. I even used the video function at my daughter’s preschool Halloween parade. The video wasn’t smooth and seamless, in fact it was a bit choppy and disjointed, but it did capture the event for posterity. And I figured out the video for the next time, so I now have my daughters twirling and singing seamlessly. It’s even got a cord so that you can pop the video up on the TV almost instantly for all to see and hear. As for its other very wonderful features, this camera captures at 9.1 megapixels and has a 3X optical zoom. It’s fully compatible with all our computers (and we have 5 in the house!) and even has a built in flash. It’s very easy to use, omitting the viewfinder in favor of the larger viewing screen and has a built in timer and everything. If I felt so inclined I could even have attached it to our tripod. I did have one initial complaint. It’s really the only thing I could find wrong with this camera. I was trying to capture a picture of my six year old swinging I my mother’s backyard and noticed that I would snap the picture and it wouldn’t actually capture the image for a second or so. Then my husband pointed out burst mode. This is when you push the button and it takes thirty or so very quick pictures in a two or three second span. Not all of the pictures are keepers, but you can usually find at least one that is good. I used this feature when capturing my five kids with Santa. Between the eight year old putting up rabbit ears, the four year olds fidgeting, and the thirteen year old eye rolling, I credit this camera for the successful happy picture. If I squint just right, I can even pretend that my kids are the angels they appear in that shot! I truly love my new little toy and highly recommend it to anyone who is looking for one. For around $199, it’s a great buy. New JVC XS-SR3 “personal theater” holds iPod’s vertically or horizontally. WAYNE, NJ, December 16, 2009 – A new JVC iPod® speaker system features a unique wraparound design, Dolby Virtual Surround, and a dock that like most docks holds an iPod vertically for music listening, but also can cradle it horizontally – ideal for widescreen viewing of video. The new JVC XS-SR3 surround dock is a sleek, glossy black speaker tube with a curved design that allows the iPod to nestle between the speakers. The iPod holder rotates for viewing video in widescreen mode and comes with four clips to hold selected iPod models. The speakers’ powerful neodymium magnets ensure clean, crisp sound, while Dolby Virtual Surround creates the illusion of a wider sound field when viewing video content. Power output is five watts and the system features two audio inputs, one analog and one digital optical. A remote control is included. In addition to its function as an iPod speaker dock, the XS-SR3 can also be used as computer speaker system. The JVC XS-SR3 is available this month for $149.95. WAYNE, NJ, December 14, 2009 – JVC today introduced a pair of soundbar home theater systems, offering consumers a home theater sound solution to meet a range of budgets and needs. Among the two new systems is the world’s first dual wireless soundbar system that features a wireless subwoofer and wireless surround speakers. The other is highlighted by a super-slim soundbar and a thin, wall-mountable amplifier. JVC’s new dual wireless soundbar system is the TH-BA3, a 280-watt, 5.1-channel surround sound system that includes a sound bar, wireless subwoofer and wireless rear speaker kit comprised of wireless left and right surround speakers and a wireless receiver. 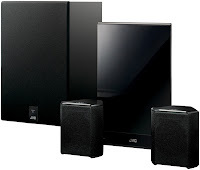 The sound bar contains four speakers – one each for the left and right main channels and two for the center channel. Also built into the sound bar is the power amplifier, surround decoding, system controls and the transmitter for the wireless surround speakers. It offers one analog and two optical digital inputs and decodes Dolby Digital, DTS and Dolby ProLogic II surround signals. The 180-watt, 4.1-channel TH-BS7 owes its slim design to JVC’s own Direct Drive speaker technology that uses a unique voice coil design and strong neodymium magnets to deliver outstanding sound quality and a broad soundfield from a super-slim speaker. The design allows the TH-BS7’s soundbar to boast a frequency range of 200 - 20,000 Hz that falls to just 200 – 10,000 Hz at 360 degrees off-axis. The soundbar features four JVC Direct Drive speakers – left and right main channels and left and right surround channels – each driven by 20 watts. The two surround channels are processed using JVC’s Front Surround technology to provide a surround sound effect without the need for rear speakers. Complementing the slim design of the soundbar is the system’s amplifier/control unit. It measures just 1.2 inches deep and can be wall mounted. It decodes Dolby Digital, DTS and Dolby Pro Logic II, and offers one analog and three optical digital inputs. The system’s wireless subwoofer features a six-inch woofer powered by a 100-watt amplifier. JVC U.S.A., headquartered in Wayne, New Jersey, is a division of JVC Americas Corp., a wholly-owned subsidiary of Victor Company of Japan Ltd. JVC distributes a complete line of video and audio equipment for the consumer and professional markets. For further product information, visit JVC’s Web site at http://www.jvc.com/ or call 1-800-526-5308. LG pulls a surprise with a new LCOS front projector with $2499 street price. The specs look rather impressive for the price.